The annual Back Care Awareness Week, run by BackCare, the UK’s leading charity for those impacted by back or neck pain, is to take place between 2 and 6 October. Back pain is one of the top common causes of absence from work throughout the country. It costs the UK economy around £15 billion every year, as over four million working days are lost as a result of the condition. Furthermore, about 80% of the UK population will suffer from back pain at some point in their lives. 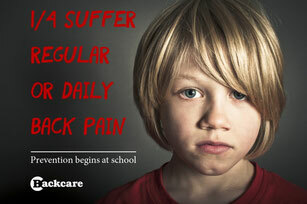 BackCare decided it was important to run a campaign targeted at children and young people, as many of the back and neck pain problems experienced by adults are due to them not looking after their backs during childhood and teenage years. The Whitchurch Clinic is urging more people to be aware of the benefits of exercise for improving their back health this World Spine Day (16th October). “We really want as many people as possible to get out there and enjoy sports. Moderate exercise is essential to build and maintain strength and flexibility, improving posture and protecting you from any further pain. • Reduce the impact: If a previous injury is causing you pain, adapt your exercise to reduce the impact on your joints and muscles. Activities such as swimming, walking or yoga can be less demanding on your body keeping your joints mobile! We recommend that, if you are experiencing pain for more than a few days then you seek professional help, as an undiagnosed problem could lead to longer-term problems if left untreated. The BCA has also created a programme of 3-minute exercises, Straighten Up UK, which can be slotted in to your daily schedule to help improve posture and prevent back pain by promoting balance, strength and flexibility in the spine. 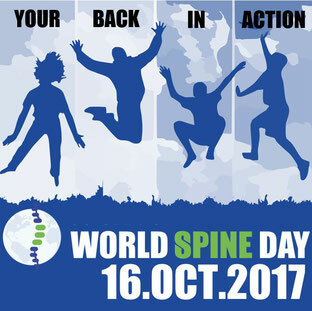 Please visit http://www.worldspineday.org/ for more information. Get up, stand up. 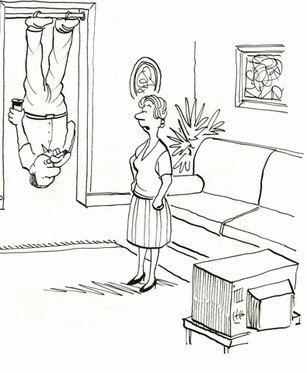 Inactivity is a leading cause of back pain. If you spend most of your day sitting make sure that you take regular breaks, ideally every 20-30 minutes. 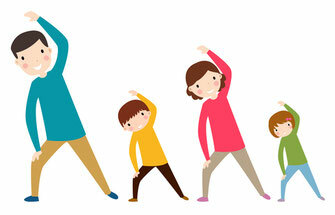 Stand up to stretch, change position and walk around a little. Stretch it out. If you struggle to get away from your seat at work, simple activities such as stretching and shoulder shrugging and even simply fidgeting in your seat can all help to keep the joints and muscles in your back moving. Keep moving. Exercise is key to a healthy back, however you don’t need to embark on any extreme fitness regimes. Adding just a few extra minutes of walking a day can have a huge impact on your posture. Straighten Up. Try incorporating some simple exercises into your daily routine. The British Chiropractic Association has developed - bit.ly/straightenupuk - a series of simple exercises designed to improve posture and help prevent back pain by promoting balance, strength and flexibility in the spine. Perfect your posture. Paying close attention to your posture can help you recognise back or neck pain triggers. People who want to improve their posture should try imagining they have a plumb line hanging straight from their ears to ankles - with everything in the middle sitting on the same line. One way to do this is to try standing in a relaxed way and then gently contracting the abdominal muscles. The Whitchurch Village Chiropractor reveals common back pain myths. To mark BackCare Awareness Week (2nd – 6th October) Sarah Beer, British Chiropractic Association member, and Chiropractor at The Whitchurch Clinic, has revealed the surprising myths chiropractors have heard from their patients about what causes their back pain and the best way to treat it. Common misconceptions about back pain include thinking a slipped disc means the disc has actually ‘slipped’ out of the spine and that you should always rest a bad back. Hanging off a door frame, and even applying WD40, are some of the strange back pain cures chiropractors across the country have heard from their patients. According to the BCA at least 81% people in Wales either suffer of have suffered from back or neck pain, with 24% suffering every day. Sarah further comments: “Whilst these may seem like funny stories, there is a really serious message here. Back pain is very common and if people don’t know enough about what causes it, or how best to treat it, they could delay their recovery or do themselves more damage. For example many people think you should stop being active if you’re suffering from back pain whereas for most people continuing moderate exercise could be beneficial". Where does Chiropractic come into it? Here at The Whitchurch Clinic we are committed to helping you on your road to recovery. Through a detailed case history, with/without an examination, we can advised if we are able to assist with your complaint. If we feel that we are unable to help we will point you in the right direction. To summarise Backcare Awareness Week, and World Spine Day, are focused on getting people conscious and active in their daily life, in order to look after their backs. Andrea and Sarah at The Whitchurch Clinic are here to help you with the diagnosis, treatment, and management of your pain. Please give us a call on 02920 617700 to see if we can help you today.